Horze.com sent me a Lormont bridle recently. I've owned many bridles ranging from $40 to $350, and I have a good feel for what you get for your money bridle-wise. At a price point of $68, my expectations were modest. I was hoping this "entry level" bridle would not be stiff and cheap-looking as so many are. And as it happened, I needed a new bridle, as Riley broke the flash loop on my old Bobby bridle a month or so ago. 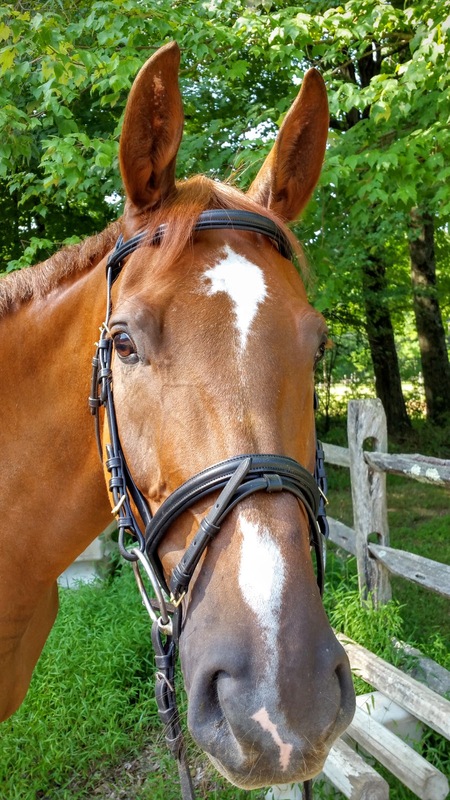 The Horze Web site has many bridles to choose from, from bitless to racing, and the Lormont Bridle is probably one of their entry level dressage bridles. What a pleasant surprise this bridle is! 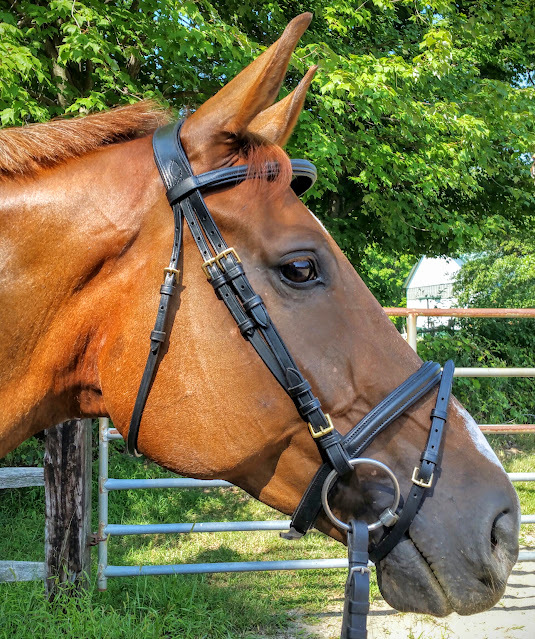 It features a soft padded, round raised nose and browband, a square shape, and brass fittings. I was interested in seeing how it fit Riley behind the ears -- the crown part is ergonomically shaped, with soft padding, and it hits the sweet spot. It comes with web reins with stoppers, but because I need long reins I didn't use them for Ri. The Lormont is a great, solid, bridle, with the added bonus of coming in an attractive style -- it would never have occurred to me to buy brass fittings, but the fittings are a soft gold and expensive-looking. The leather is soft but not mushy, and I like its light weight. 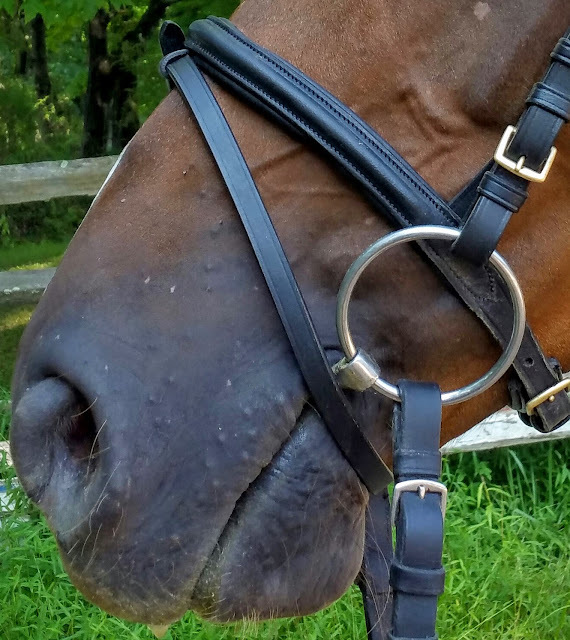 The first few times I used it, I got many compliments -- now granted, my old bridle had broken piece where the flash loop was partly detached (it was unsightly), but my trainer and several boarders all remarked on how much they liked the Lormont. I love the ergonomic headstall, even though I can't use my own beaded browband with it due to the larger loop-size it requies. 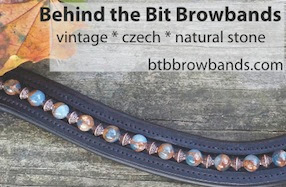 I've ordered a new empty browband with the larger loops so I can bead him a new one. While I can live without the red Z branding (see image below), it is pretty much like all of the manufacturer logos on the headpiece. It does not stick out, particularly, next time I'd suggest they go for etched silver instead of red. With bridles at this price point you can have issues early on -- cracking, dye bleeding, stretching, chipping of finish. 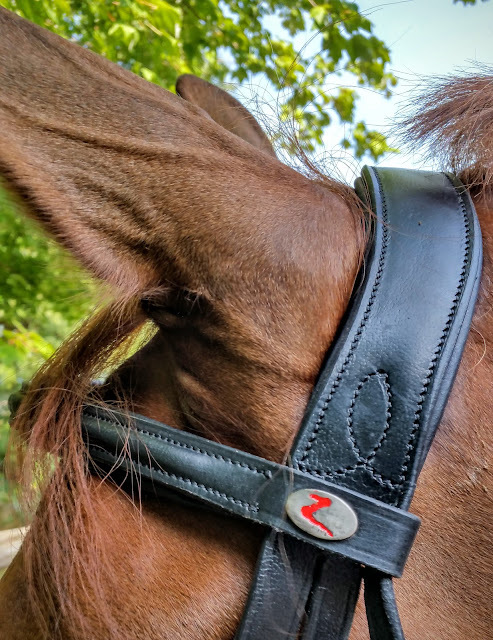 While I can't speak to the bridle's durability long term, but after five rides no obvious issues are evident. For the price, it is a very nice bridle. I think Riley looks stunning in it! I always look for brass fittings because they match my Aurigan bit, and I could use a new bridle, too! Thanks for the review. THIRD TIME FOR THIS COMMENT--I am either not awake (and clicked the "Sign Out" button in error) or my Comment as identity was missing the second time. Comment lost each time. I am so glad you did a bridle review, so I can ask my burning question (I have tried to ask once or twice on COTH and gotten nowhere - guess I am just too dumb for words). 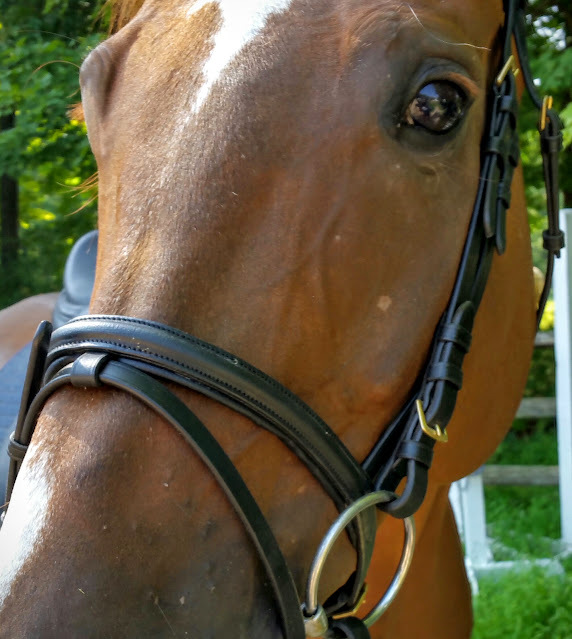 Can you please tell me what it is that makes a $350 bridle so much better than, say, a $130 Harwich bridle from SmartPak? I am leaving out the $60 Plymouth even though to my EYE, looking in the catalog, it doesn't look a whole lot different, either. I get that nicer leather = more money but seriously, I have felt the $100-150 kind and the uber-fancy ones and don't notice much difference, other than snob appeal. Maybe I'm missing something?